Hartley's Original Pork Pies has been in business since 1900. That's amazing in this come-and-go business environment. Why have they been able to last so long while so many other businesses have failed? It’s simple – a concentrated menu, fresh ingredients and terrific customer service. Simple, but simply done well. Every Saturday, my father used to come home with a box or bag full and was quickly attacked by the rest of the family. 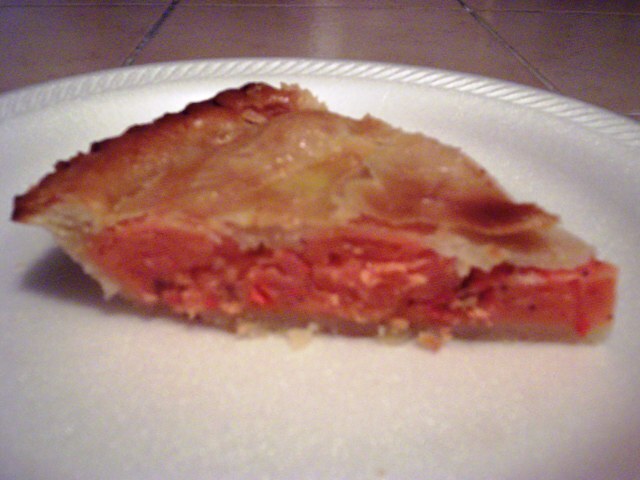 My sister had the nauseating habit of biting the bottom crust and drinking all the juice before she ate her pie. I wonder if she still does this? At this time, there were only pork pies available. Now Hartley's has several varieties. Laura had never tried the pork pies and I was in the mood for a trip down memory lane, so on a Friday morning at 11:20 a.m., Laura entered the tiny shop. Mmm … it smelled good in there. She noticed a variety of both small and large pies. The small makes a nice meal for one and the family size can give you about six slices. 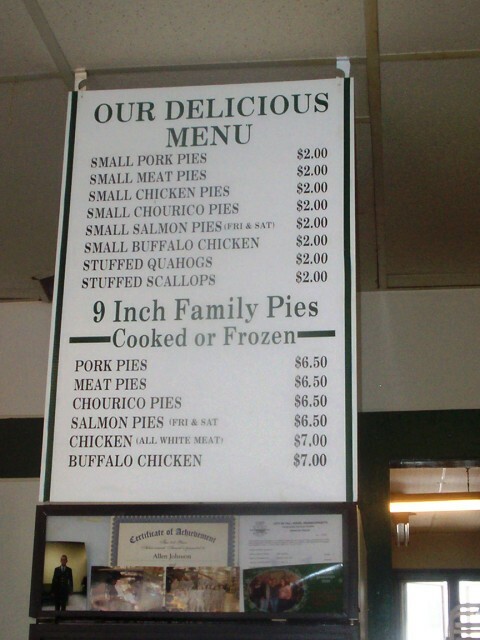 At $2 for the small and $6.50 for the large ($7 for the two chicken varieties), these pies are quite the bargain. Plus, they heat up beautifully. You're not limited to their famous pork pies, however. They now carry meat pies, chicken and buffalo chicken pies, chourico (Portuguese sausage) pies and salmon pies (only on Fridays and Saturdays). They also have stuffed quahogs and scallops. You can even get a few desserts like carrot cake, cupcakes, brownies and bread pudding (from $1-2.50). When Laura came home, I saw that she had purchased quite the feast. She bought one large salmon pie which we would have for dinner (plus a stuffed quahog for hubby). 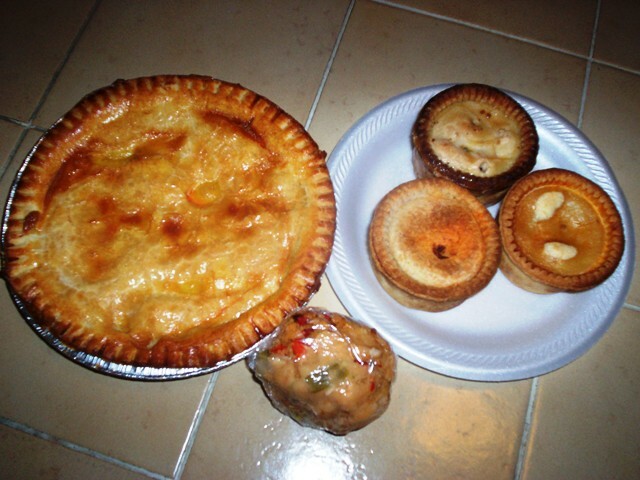 For our lunch, she bought three small pies for us to share: buffalo chicken, pork and chourico. For all this food our total came to $14.50. This was a lot of food! We cut the small pies in half and dug in. The pies are as delicious as I remembered. The chourico was my favorite – nicely spicy and a great flaky crust. The buffalo chicken had a nice kick and the pork was as juicy as ever. Then, when we tasted the salmon for dinner, oh my! This was now my absolute favorite. They use the more flavorful red salmon (rather than the milder pink), so you have a very tasty, spicy, fishy flavor in an amazing crust. I loved this! If you’re looking for a tasty, inexpensive treat, get yourself to Hartley's. Over 100 years of experience can't do you wrong. They did it right back then and they're doing it right today. 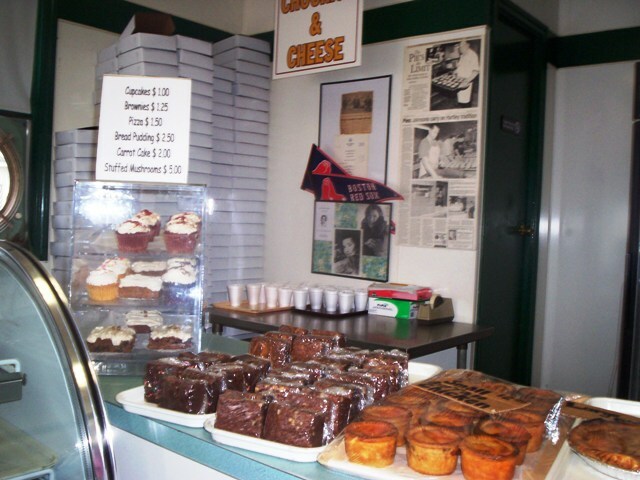 Hartley’s Original Pork Pies is open from 6 a.m. to 5 p.m. Monday through Friday, and 6 a.m. to 3 p.m. Saturday. They are closed on Sunday. 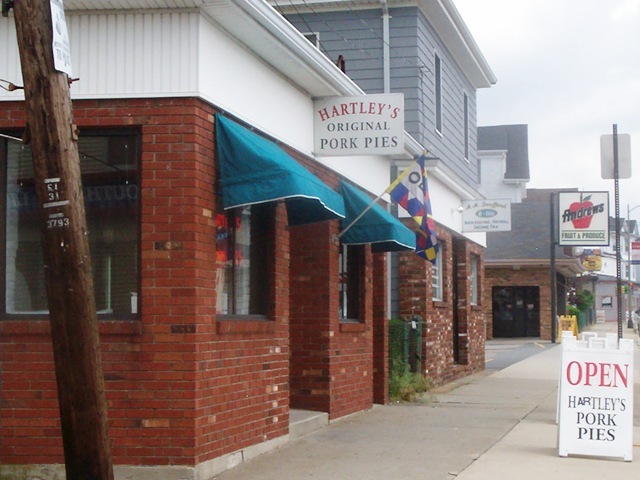 Hartley's also has locations in Somerset and Lincoln, RI, but according to the woman at the Fall River location, the companies are not affiliated with each other. 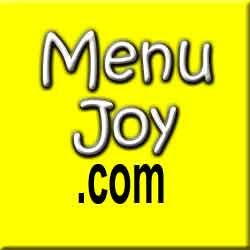 Don't forget to check out our friends at MenuJoy.com for area restaurant menus.